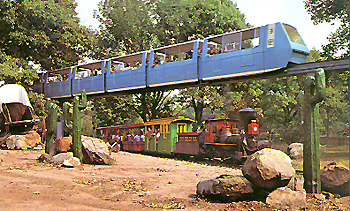 Old postcard view of HersheyPark Monorail. For this installment of Novelty Monorails, return with us to Pennsylvania where America's favorite chocolate company operates HersheyPark and the Blue Cross/Blue Shield Monorail. 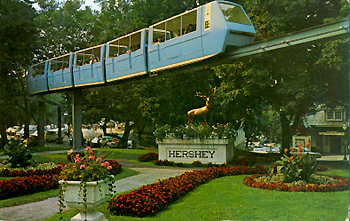 This is one of the first monorails I ever rode, but in 1996, the executive officers of TMS made the pilgrimage to Hershey and besides the ride on the train, we canvassed the gift shop for monorail related items and repeatedly took rides on the Hershey Wildcat, their then new wooden coaster. Traveling through the park grounds and over ZooAmerica, the monorail has quite a few areas where the scenery gets interesting since it negotiates a shared right of way with an old fashioned train ride and crosses a ravine where the ground drops away dramatically. The three six car trains are all painted blue and emblazoned with the Blue Cross/Blue Shield logo. This is one of two monorail systems I know of in an amusement park that has a sponsor. (The other is at Geauga Lake, now Six Flags over Ohio) It's interesting that the safest form of transit in the world has a sponsor from the health care industry. Thirty six passengers can be carried on the six minute round trip. Capable of carrying 1300 passengers per hour at up to twelve miles an hour, this is the first of the Universal Mobility Incorporated monorailsthat have been installed all over the country. (Bombardier owns the assets of UMI now, and has installed updated versions of these trains in Jacksonville and Tampa.) My grandparents used to lament the fact that the monorail no longer stopped at both of its stations. Now it is mainly used as a sight seer, since the trip to the "making of chocolate" tour is no more. Park employees told me that the now unused station is sometimes put into service for special events staged for groups that are using a nearby building. Since the thirty one year old monorail is still a popular ride with guests, HersheyPark will probably introduce a new crop of youngsters to monorail travel this summer. I'm sure they're expecting attendance to swell with the recent opening of their new coaster, the Lightning Racer.